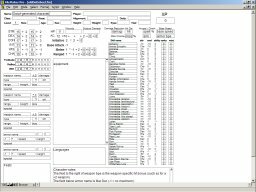 I have three D&D character sheets to offer. Sheet one uses an old version of FileMaker Pro, is designed for an 800x600 screen, and was designed in the Third Edition days. 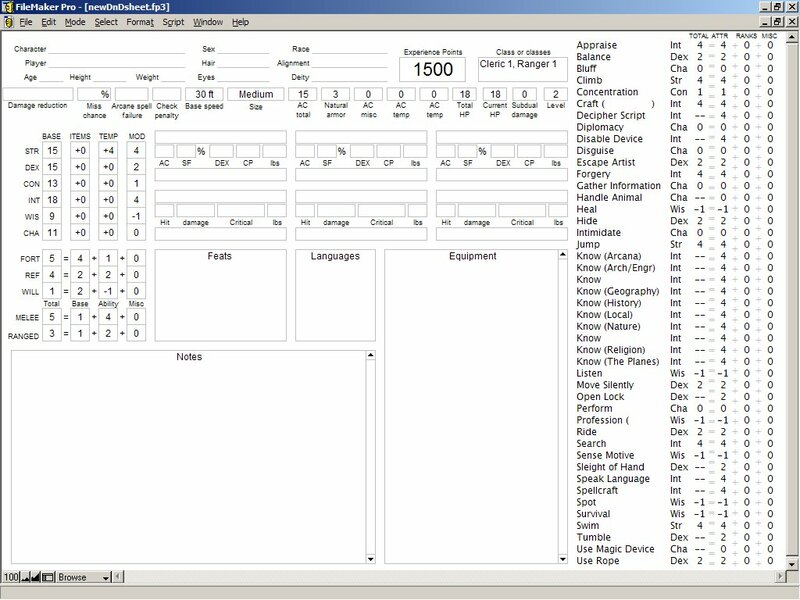 Sheet two was designed on a newer laptop, 1024x768 screen, for D&D 3.5, using FileMaker Pro 3. These are pretty old versions; I'm told the newest edition of FileMaker has dropped support for importing these older formats. 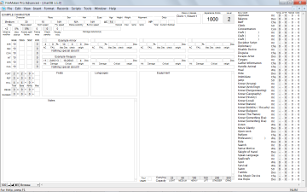 The third character sheet is in FileMaker 7 format, formatted for a 1440x900 screen. There have been many small changes and bug fixes, but the 'headline' changes are the addition of a fourth weapon and a fourth armor slot (useful to include something like shield of faith as an 'armor' that can be worn), additional speeds (swim, fly, burrow), and a few more skill slots for crafts and knowledge skills. 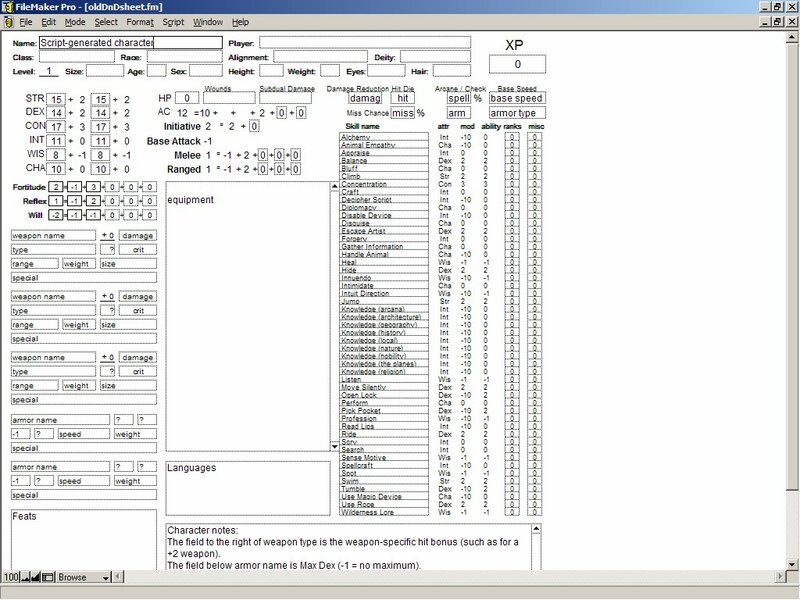 I have also expanded the notes and equipment fields and added additional carrying capacities calculated by strength and size. 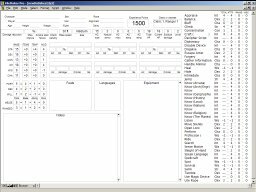 These character sheets are licensed under a Creative Commons Attribution 3.0 Unported License. See creativecommons.org for the full text of the license. 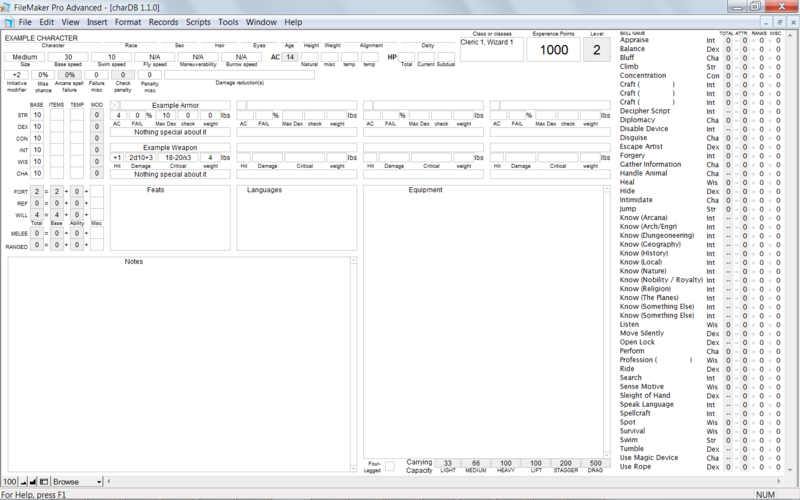 Attribute to Ben Davenport or include a link to this file's original posting location: http://www.monkeysushi.net/gaming/DnD/3.5/character sheets.html.